I remember that some years ago, have produced a rendering in 10/15 hours was cause for pride. Now it simply means that you are a newbie! 1) Use Low resolution for rendering tests. I know, everyone likes to render a big image, but we risk to waste too many time if we always use 800×600 minimum. 2) Use Rendering Region: render only what interests you. Time to time check your shaders, verify the little differences.. and quickly find the result you’re looking for. 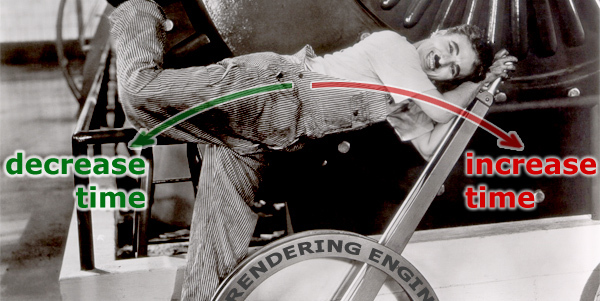 5) In the Vray Global Switches rollout use Override Mtl. We can use a very simple material like gray to test the light in the scene. When we are convinced of the light scene add the various shaders. The image quality will be lower, but also the time to render it! 7) About Vray Light, check the option “Store with irradiance map“. Even here, lose a little of shadows but the time is decidedly lower. All this attentions will allow us to lower a lot the time setting. The final time rendering will be only a small part of a comparison!! I hope it is a useful reminder and I hope to improve this post with your suggestions. I await your comments and advice! very interesting informatios!! thanks a lot! thank you for sharing and greets!! also you can keep 8 subdiv to all your materials (reflect and refract) while still in rendering test and for those materials that are far away from the camera. thanks for sharing with you! i’am sorry can you give me about rendering with fast. 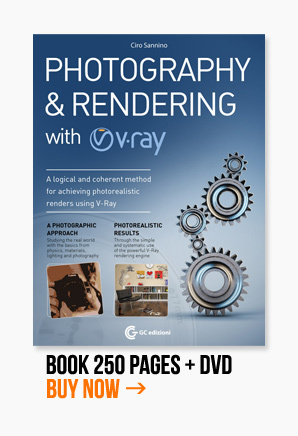 If you want faster render with vray !!! In my blog I try to suggest you how to improve your vray skill. Yes… you go faster, but you lost the control. I didn’t mention vray photon map, because I think this is an OLD way to get global illumination. very helpfull sggstion to me. thanks a lot for your best video education,I enjoy them a lot because they make my modelings a lot better than it was before. thanks for the share. For your presets I use SolidRocks, which is worth the investment. I would learn V-Ray first because presets will only get you so far. But i wanna fundamental knowledge of vray for 3dsmax exterior rendering. I hope you are intrested my rendering question. frist thanks very much. u help us in animation field. and thank again u give us importants notes. sir, i need realistic interioer lighting and rendering setups. please, Give us about tips. about material settings in v-ray. Please give some tutorial regarding high pixel high quality ,means photo clarity renderings. Thanks,………….what about a very high image quality? how can we get that in no much time? Thanks!!! for the tip sir, but do you have a tips in vray on how to render animation with out flickering motions? cause the problem with vray when i animate thee seems to be flicker in animations especially in moving objects. Thanks a lot for your tips Ciro. They’re always very usefull for all. Thanks Ciro .. this is very important issue . wow its very helpful, thanks. for next article i hope you discuss a variety of makes metal with v ray, because for a variety of metal materials is strongly influenced by the background, so i want make some material metal with v ray with simple background but fully metal in material, thanks. hi ciro, thanx for the very useful and lovely tips. i always wait for your new post. i just found your site today, your tips’n tricks are very interesting. I’d like to share my experience of render settings with vray. – i don’t like using override mtl because i can’t see the “bleed” or “bounces” of material colors, but not loading maps is very fast ! After all that stuff, image render is faster but quality is far away and we have to know that many details are not visible…. details that we will have to handle with a high render. I’m using render region with good quality presets to see details, and go back to low quality presets for global img. First monthes i used vray, i spent many times playing with settings, trying to get renders done in time. Sometimes that was painfull, but that helped me learning vray (i’m still far from a vray master !). 2) – “Solid Rocks”, this one is not free but really, really cheap regarding render time saving. I don’t use it when working on my scene, but only when rendering final high big images in big resolution (at least 3000×4000) with big quality. I have to render several times (2 or 4x) my final image beacause my clients change their goals, deadlines are very short… that’s why i’m using it. I don’t want to say “this plugin is the solution” NOOOO ! but it makes mathematical interpretations of your scene depending on the render size and gives you settings that are really optimized. The goal is to avoid unnecessary high presets. I totally agree with you when you say “keep the control”, and i still play with settings, but deadlines are short …. so here is my workflow to speed up calculating and see results and focus my brain on client desires. very nice tips hiro. i know some tips you say. however your post is useful to me. why do not use fixed for image sampler? Hi Mahdi… it’s because the other antialiasing are optimized. Fixed is the only one no-optimized… you can use it with value=1 to get faster image with a really poor antialising. Muchas gracias, consejos de gran utilidad. © 2008 Cg Blog is a trading name of nothing - All rights reserved.